These U.S. history posters bring the past to life in meticulous artistic detail. And when matted inside a walnut frame, the finished product is as eye-catching as it is educational. 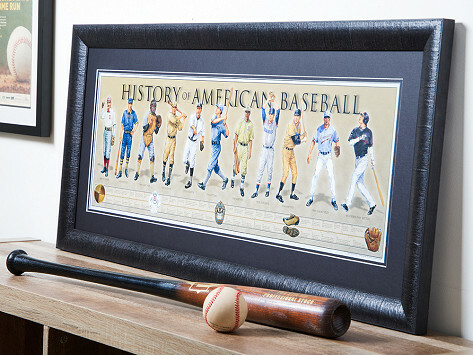 From the evolution of baseball and military uniforms to the progression of aviation, each Made in the USA poster carefully recreates detailed looks from periods throughout history up to the present day. Dimensions: 43.88” x 19.25” x 1"
I bought the flag history framed print. I love it. Lots of compliments and a great conversation piece. Put some artful U.S. history in your surroundings with these detailed posters. 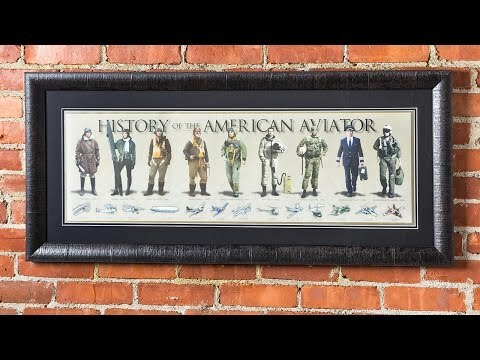 From early firefighters to the evolution of aviation, these illustrations show how uniforms, equipment and more evolved throughout the years. And each one is Made in the USA. The way History America creates each poster is (almost) as interesting as the history it honors. After careful research, models reenact looks throughout the decades—and centuries. From muskets to fatigues, the costumes and props capture the essence of each era. Founder Mark Waterman photographs as many as 1,000 shots of each look, then the artists at History America paint the final images for a striking effect. Mark has always been interested in history and became intrigued by the evolution of firefighter’s gear. He decided to create a visual way to honor it. From there, he took more vocations that not only preserve the past, but also bring it to life.